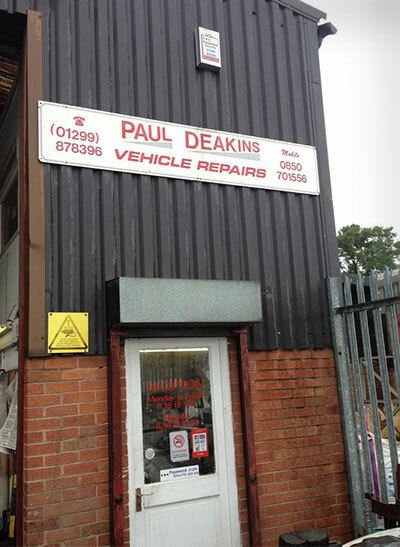 Paul Deakins Vehicle Repairs has been providing the local area with a quality auto repairs service since 1994. Over the last 40 years, Paul has built up an excellent reputation among customers. So if you're looking to get your domestic or commercial vehicle fixed by experts who really know what they're doing, give us a call. Has your car broken down? Call us 24 hours a day for a fast, reliable breakdown recovery service. Feel free to call us or visit us at our garage. At Paul Deakins Vehicle Repairs, our fully qualified team can provide all expert repairs on your car and commercial vehicles. So, you can rely on us to always get the job done and right! Established in Stourport-on-Severn in 1994, Paul Deakins Vehicle Repairs has proudly been providing the local areas with his quality auto repair service. Over the last 40 years, Paul has built up a fantastic reputation among his customers. So if you are looking to have your domestic or commercial vehicle fixed by experts who really know what they are doing, give us a call today. At Paul Deakins Vehicle Repairs, our rates are guaranteed to be as low as possible, without compromising on the service. Our goal is to please all customers with our helpful advice, wherever it may be required. For any further information, get in touch with our friendly staff and they will be there to help in any way they can. For a first-class vehicle repair service at competitive prices, around the areas of Stourport-on-Severn, Kidderminster, Worcester, Bewdley, Blakedown or Cleobury, call us on 01299 878 396 or on our 24-hour emergency line on 07850 701 556.